Temporary home of some of Wilson's nefarious residents. 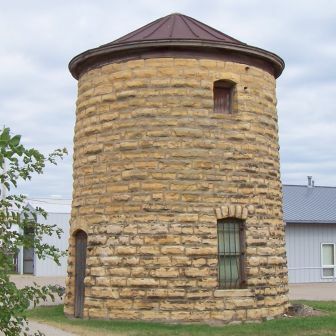 Yes, this cylindrical limestone structure near an alley off Main Street (Avenue E, west side between 25th and 26th Streets) served as the old city jail in the late 1950' and early 1960'. Constructed in 1907 as a watertower, bars were installed on the windows and it was remodeled as a jail in 1956. It served as the city jail until a new fire station/jail was built in 1963. This 25-foot tall limestone beauty now stands as a historical marker. The Old City Jail has been on the National Register of Historic places since 2002.